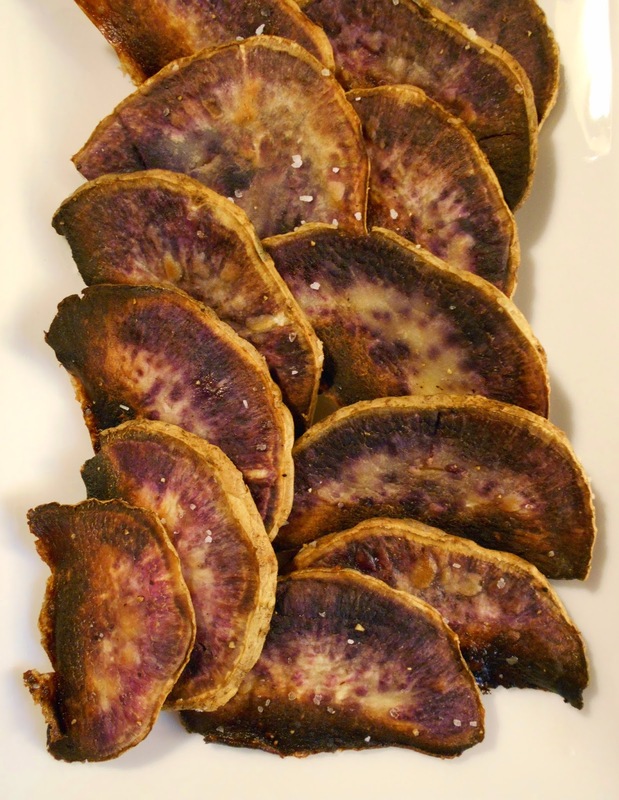 variegated purple interior, and crisping in the oven with high heat adds a lovely brown tone. The dense texture of the flesh is perfect for chips, and the savory seasonings are balanced by just a hint of sweetness. This classic sweet/savory combination makes these chips irresistible. And bonus: These are really healthy for you, too! Preheat oven to 450°F. Prepare two baking sheets by lining with foil and spraying with nonstick cooking spray. Set aside. dry as possible. Place potato slices in a large, shallow casserole or wide pan. Drizzle with olive oil, sprinkle with salt, pepper, and grill seasoning. Rub potato slices well, evenly distributing oil and seasonings. You've Never Had a Crouton Made with These! This Will Have You Lickin' the Pot!